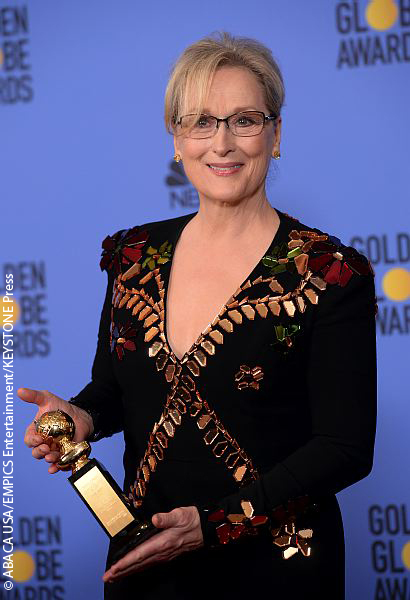 Meryl Streep is revered for her remarkable body of work, but thanks to her Golden Globes speech, she’s now also respected for taking a hard stance against president-elect Donald Trump. The 30-time Golden Globe nominee (yes, 30), was honored with the Cecil B. DeMille Award last night (Jan. 8) for her distinguished career. Upon accepting the award, she took the opportunity to voice her disdain for the 70-year-old, soon-to-be inaugurated Republican. After Meryl’s friend — and one of last night’s winners — Viola Davis presented her with the award, Meryl criticized Donald’s campaign rhetoric and scolded him for mocking New York Times reporter Serge Kovaleski in November 2015. Serge has a condition that affects his joint mobility. She also advocated for free press and urged fellow Hollywood stars to join her in supporting the media. The crowd at the Beverly Hilton erupted in applause and celebrities not in attendance, like Julianne Moore and Ellen DeGeneres, commended Meryl on social media. Check out his string of Monday morning (Jan. 9) tweets below. You never mocked him? Do you not own a TV? No journalist needs to write or say anything to make you “look bad” Mr Trump. You do that all by yourself with your ridiculous tweets and your very immature behaviour. May God help the USA for the next 4 years. i always loved Meryl Streep as an actress but respect her more than ever after that speech! Don’t come for Meryl. No one comes for Meryl and gets away with it. Meryl – my hat is off to you – you rock! Thanks for having the guts to call him out! I can remember my mom telling me ” if you can’t say something nice about someone don’t say anything”. You know what, I can’t think of a damned thing to say about Donald Trump! Meryl Streep’s record as an outstanding actor is recognized by all but Donald Trump, i guess. He continues to demonstrate extremely immature behaviour. Will he be spending the next four years tweeting in the White House? May God help the United States of America. Even Trump has come out and said Meryl is one of the best actresses working and a “fine” person on top of that. Of course he changed his tune when she came after him though. He’s a moron.